The third trimester feels so long–but so short at the same time. It evokes a lot of emotion, as you want your body back, want your baby here, and simultaneously wonder what you are supposed to do once your baby arrives. Don’t worry, it’ll go faster than you thought possible, and you may find that you kind of miss being pregnant (crazy, I know!) 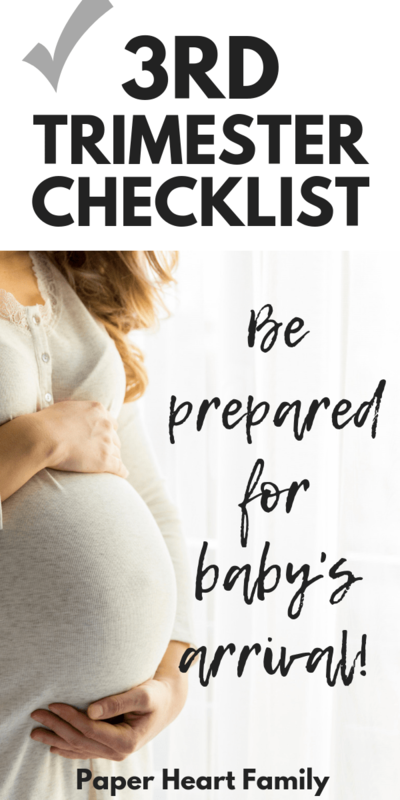 In the meantime, there are many things to do before baby arrives that you will want to add to your third trimester checklist to ensure a smooth transition for both you and your baby. With my first child, I anxiously read as much information as I could online about what was necessary for the third trimester. I am a “planner,” and so I did what I do best–I planned! It turned out there were a lot of tasks that weren’t totally necessary, and by the time my second pregnancy rolled around, I had a much better idea of what is actually essential. See, life with a newborn equates to no time for anything else. That means it’s imperative to get certain things done BEFORE the baby arrives. On the other hand, you need to enjoy the season before baby because, quite frankly, it’s going to be a lot harder to get any “you” time for the next… twenty years. Baby clothing and bedding should all be washed before it reaches your baby. Your newborn has sensitive virgin skin, and it’s super easy for it to become irritated. Not only that, but some fabric can have some chemical residue from processing. I will admit, there were a couple of pieces of clothing we didn’t wash before putting them on our second child. She was entirely fine-but the safest option is to wash that fabric anyway. Only wash (or remove tags, for that matter) what you think you will use in a week’s worth of time. There is no telling how long your baby will be in each size of clothing, and they grow out of the first outfits the fastest. You can take back extra clothing in exchange for a bigger size. You may end up a little stir-crazy if you always stay indoors with your newborn… Most doctors actually recommend getting out in the fresh air with your littles, as long as you follow a few precautions. Although some fresh air is good, it’s generally recommended to keep them out of crowded places for the first couple of months. That means trips to a busy grocery store or the mall should be kept to a minimum. You don’t want to go to places because you HAVE to with a newborn. Every time I ran to the store in the first couple of months (it only happened twice before I decided it wasn’t worth it) the trip ended with both of us almost in tears. Although stocking up on postpartum essentials is SUPER essential, it’s also important to think about the everyday things you will need for the next couple of months. If you haven’t had your baby shower yet, this is the time to do it! If you aren’t a big party person, see about throwing a quick get together. If nothing else, you should get together with your loved ones to celebrate your new baby. That is a GREAT reason to celebrate. This third trimester to-do list wouldn’t be complete without adding some fun things to do before baby arrives. You might end upresenting your husband after baby after baby arrives. There are SO many changes that happen in a relationship once you bring kids into the picture. Don’t get me wrong, some of these are good changes–really good. You get to experience amazing parts of parenthood together. But the bad things can be a little complicated to deal with. Your focus completely changes, and you will find it becomes easy to forget to appreciate each other. Plan a special date for the two of you and go do something nice. Turn off the screens and other distractions and enjoy each other. I love taking courses–especially when I can do it online. In today’s digital age, the information that can be found on the web is limitless. Paid courses can be a bit of a gamble because you can’t know what you are going to get –ANYONE and their dog can create a course and sell it online. I was disappointed with a lot of my purchases because the info I received was outdated and watered down. Once you start learning the right places to look for your information, you’ll find there’s a wealth of great course options. 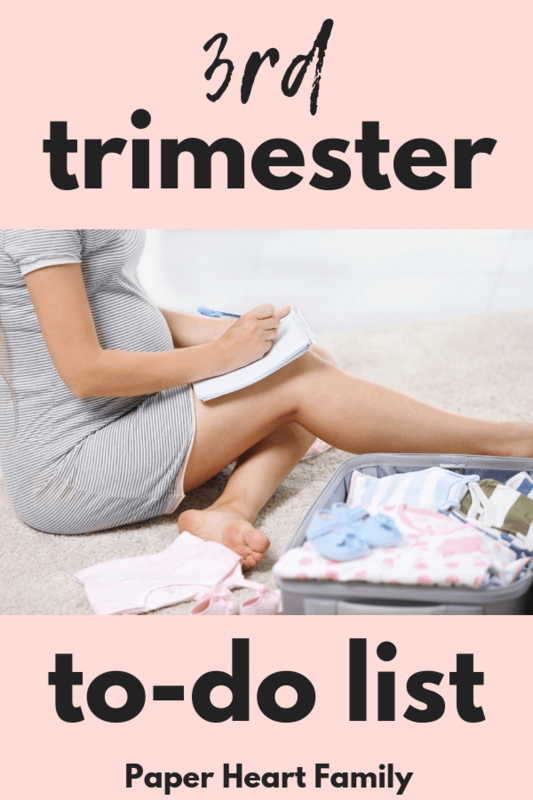 I wish that I would have had a friend who could direct ME to a reputable source, which is why I wanted to give you a couple of recommendations that you should add to your third trimester checklist. The majority of new mothers will NEVER have to do CPR on their baby, but it’s critical that you know how to do it just in case something happens. There are online free and paid options for learning infant CPR. Personally, I would recommend doing this kind of class in person if you can. You can contact your local hospital or health department to see if there is a training coming up near you. If you want to avoid the epidural, I HIGHLY suggest my friend Liesel’s online class Birth It Up. I had both types of birth, medicated and non-medicated. The reason that I was able to succeed and give birth without the epidural is because I was encouraged and educated. Liesel is a labor and delivery nurse and mom who developed this course because she wanted to help women all over the world have the natural birth that they dream of. Breastfeeding is both exhausting and rewarding, so you definitely want to gear up and prepare yourself as much as possible. Personally, I think a course on how to breastfeed is something all new mothers should take. There is not much that feels “natural” about breastfeeding at first, and frankly, it’s still really HARD work once you get the hang of it. For a breastfeeding course, I recommend Milkology. Stacey is a certified lactation educator (CLE) with a Masters in Teaching (MAT), and YEARS of experience helping women succeed at breastfeeding. Milkology is an in-depth and super affordable lactation course, and it’s SO much easier to get all of your info in the same place. Check out my top suggestions for online classes on childbirth, breastfeeding and newborn and postpartum care. If you aren’t interested in paying for something, there is a WEALTH of free information out there. I think the most significant difference between free and paid courses is whether or not you want to have to hunt down the information and hope that it’s up to date. Conveniently, the same L&D nurse who does the prenatal course ALSO offers a lite free version you can check out at no risk or expense. There are plenty of women who were happy with the free version, so it’s definitely worth a try. For free breastfeeding information, consider checking out kellymom.com. It’s an EXCELLENT resource, and I found myself referencing this site constantly when I was breastfeeding my littles. The thought of choosing a pediatrician was incredibly daunting to me. I don’t typically go out of my way to socialize with others, but I did NOT want to go in blind when it came to my child’s healthcare provider. You can cross this one off of your third trimester checklist when you have considered a few key things and made your choice. Find a pediatrician that aligns with your values. When you become a parent, you’ll realize that you have a lot of opinions on things that you may have never thought about before. Do you want to vaccinate? Do you want to breastfeed long term? These are controversial topics that may leave you heated and red in the face when discussed, so find a doctor who will arm you with the best knowledge, but also who will support you in your decisions for your child. If you have friends with kids, ask who they like to use. We tend to hold similar values to the people with whom we are close, so this is (usually) a solid way to find a good pediatrician. Are they close to where you live? Although you may think now that you don’t mind an hour-each-way kind of drive, remember that babies go to the doctor A LOT and it may be more taxing than you realize, particularly when they are screaming or suffering. How does their online profile look? There are a couple of different factors to consider when you look at a possible pediatrician for your baby. You can check online reviews, but these are often emotionally based, and it’s hard to discern useful information from bad. Many clinics have a small “about me” excerpt for their practitioners, and this can give you a peek into what kind of values and interests they may have. This is probably one of the HARDEST parts of having a baby. I mean–it’s a weighty decision and one your child will be stuck with for the rest of their life. Honestly, if you can’t cross this one off of your third trimester checklist, you can decide at the hospital. It’s a good idea to have a couple of names in mind before you go into labor. After giving birth, while I was still drugged up in the hospital, we made the monumental decision to change our second baby’s name. Sometimes they just “look” like they need a different name, so don’t feel like this decision is set in stone. Just try not to let the drugs do the talking. If you haven’t already, start planning your postpartum meals now. You won’t have the time or energy to cook, so stock up that freezer with some ready-made meals. Also, make sure your pantry is well stocked with some easy and healthy snacks. I did not do this with my first and I ended up making a lot of unhealthy food choices that left me with a stomach ache. I was smarter with my second and made some pre-baby freezer meals. A quick Google search will yield a ton of options for you. We spent hours and hours on our first daughter’s bedroom. She had a Harry Potter themed nursery (Ravenclaw of course! ), and it was so much fun to put together. We quickly found out after she was born that we never actually spent any time in her room. We kept her sleeping in our room for the first six months, and we usually spent our days in other rooms in the house. Set up the nursery–but make sure you are having fun while you do it. Everything does NOT have to be perfect before your baby is here. If you don’t get it done during the third trimester, don’t stress about it. It will STILL be there when you are ready to finish it. The cost of baby’s first year is roughly 12,000 dollars–and that number will ONLY increase. It seems like a lot of money, but it IS doable for most people. You just need to plan for it. There are some things you can do and buy that will help mitigate that cost a little. In the meantime, you need to prepare for how you will take care of your finances post-baby. For us, that meant automation on our bills. I usually prefer NOT to automate our bills (it helps me stay aware of where our money is going), but I didn’t have time to deal with it postpartum. You have a lot of things you need to start keeping track of, and forgetful “mom brain” is a thing. Car seats can be a little nerve-wracking to install the first time around, and it’s definitely one of those things you DON’T want to get wrong. Getting the car seat tight enough is a serious chore with most car seats until you’ve had a little practice, so be patient with yourself. It turned out that our hospital provided a car seat check before they would even let us bring our baby down to the car. It’s worth checking with your hospital to see if they offer something similar. If not, phone your local fire department and see if they would mind taking a look at it. Most hospitals will allow you to preregister–and many of them have an option to do this online! 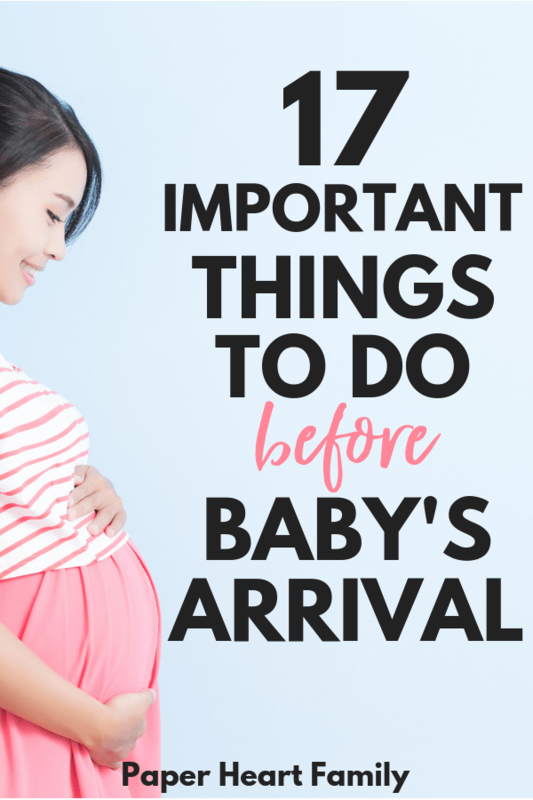 It’s impossible to know when your little one will make their grand entrance into the world, so do what you can to be ready for it. Along with pre-registering, many hospitals will also allow you to tour their facilities. If you are iffy on where you will deliver, spending time touring the hospital could help solidify your decision. Even if you are dead set on the hospital you will deliver at, it’s still a good idea to know what you are getting into beforehand. Some places have a GPS tag that is attached to your baby. If they go a certain distance away from the nursery, an alarm can sound. Other hospitals have a video set up where you can watch your baby 24/7 if they are away from you in the nursery. Make sure you have a good understanding of how YOUR baby will stay safe during their hospital stay. If you have other kids, you will want to make sure you have a good understanding of the rules regarding visitation. Some hospitals do not allow kids under a certain age during winter months when RSV is prevalent. Our hospital would only allow kids under twelve if they were siblings. Will you deliver in the same room you give birth in? This is a bigger deal for some women. I delivered in a large room with a jacuzzi tub in the corner. I loved that I gave birth and didn’t have to be moved later. I know it sounds strange, but it helps you feel more like the room is “yours.” It’s more comfortable. Some women may be a little grossed out to sleep in the same space they gave birth in, but honestly it’s a little difficult to gross out a woman who just gave birth. We had two different hospitals we were considering, each with their own set of amenities. Some hospitals give you all of your meals for free, while others don’t. Some have nice perks, such as a jacuzzi tub or a massage chair. Pick the option that provides you with the comforts you think yourself most likely to want or need. If you haven’t already, now is the time to critically examine what it is you want for your birthing experience. Personally, I did not write up a birth plan for either of my babies. I had a scheduled induction with both babies, and so my doctor and I were able to discuss everything before stuff got crazy. Here are some key things you need to think about before crossing this off of your third trimester checklist. Do you want a medicated or natural birth? What pain relief do you want for your birthing experience? How many people (and whom) do you want present in the room during the birth? Is skin-to-skin contact important right away? Will you allow student midwives or doctors in the room if asked? Do you want to do delayed cord clamping? Is there someone specific that you want to cut the cord? Your doctor is going to have you pay a lot more attention to your baby’s kicks during these last couple of months. One of the earliest signs of distress in your baby is a decrease in kicking, and many babies are saved because their mom noticed a change in their baby’s movement patterns and alerted their doctor early on. Definitely report to your healthcare provider if you see any decrease in movement. This may seem like an obvious suggestion, but it’s one of those things you really shouldn’t put off (but we tend to anyway). You definitely don’t want to be the new mom that is stressed and desperately packing a small bag with the bare essentials after her water breaks in the middle of the night–and there’s no way to know IF and WHEN this will happen. If you have more than one vehicle, pack a second bag. It’s not going to hurt anything, and it’s better to be prepared! This is the most important thing on your third trimester checklist–and it’s the one thing we often forget. Be present and enjoy your last couple of months of pregnancy and pre-baby life. Go get a massage, a pedicure, or a haircut. These are the things you aren’t going to have time for once your little one is here, and you deserve it. This post was a guest post written by Audrey of Mommy Enlightened. Audrey is a mom of two who loves her kids, blogging, coffee, and her cats. She is currently finishing up a bachelor’s in psychology and has a work history in child welfare and teenage substance abuse. She blogs over at mommyenlightened.com where she discusses topics such as pregnancy, babies and toddlerhood.